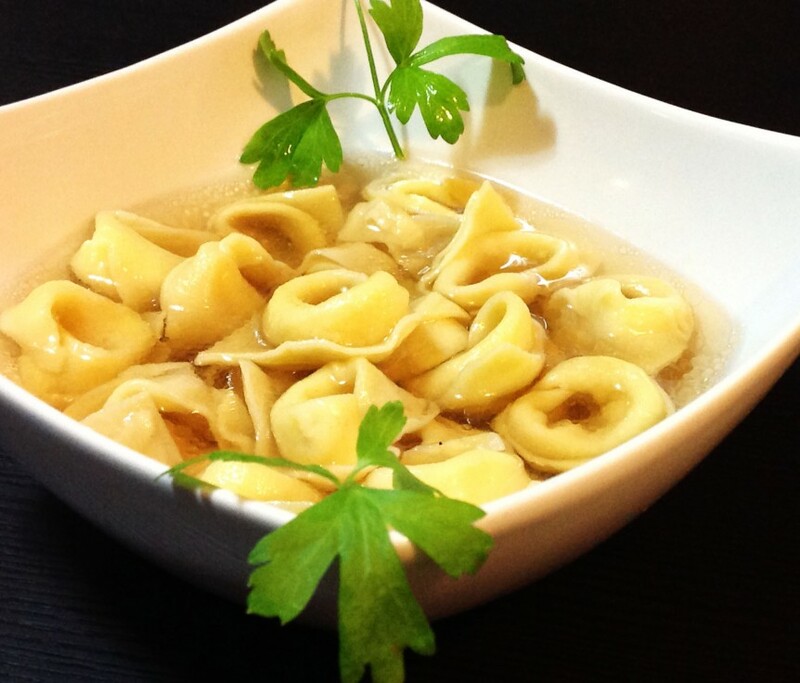 This is one of Emilia-Romagna’s typical dishes. It’s not the classic version (with pork loin, one egg, butter and sometimes white wine), but a variation taken from the area between Modena and Reggio Emilia. The rezdore of Emilia used to do the sfoglia by hand, but now they use a food processor. First, make a stock. Put the beef brisket, bones, chicken, unpeeled onion and celery in a large stockpot. Halve the carrot lengthways, and add to the pan with a pinch of sea salt. Pour over 2 litres of cold water, or enough to cover. Bring to the boil, then cover and simmer for 4 hours, skimming occasionally. Meanwhile, prepare the pasta dough. Blend the ingredients in a food processor (or combine by hand) until they come together and you have a soft but firm dough. Lightly dust with flour, wrap in clingfilm and leave to rest for 30 minutes. For the filling, heat a little oil in a saucepan, season the mince and fry until cooked through. Drain any water and leave to cool. Transfer to a food processor with the prosciutto, mortadella and nutmeg. Finely grate in the Parmesan, then blitz (or finely chop together by hand) until you have a very fine mixture. You’ll need to make the pasta in stages so it doesn’t dry out. Divide the dough into 8 pieces. Use a pasta machine (or a floured rolling pin) to roll out 1 piece (covering the rest with clingfilm or a tea towel ) into a long, flat, very thin 6cm-wide strip. Slice into 3cm squares. To make the tortellini, lightly dust a tray with flour. Place a ¼ of a teaspoon of filling in the middle of a square of pasta. Fold the pasta over into a triangle, and press at the edges to seal. Wind the folded edge around the tip of your middle finger and press the ends to form a ring. Continue until you have used all the rolled-out dough, then roll the next piece and keep going until it’s all used up. You can make meatballs or ragù with any leftover filling. To serve, strain the stock and discard the meat and vegetables. Taste and adjust the salt, if it’s necessary. Bring to the boil, add the tortellini and cook for about 3 minutes, or till they rise to the surface. Ladle into bowls and serve with extra Parmesan.